One of the most eye catching log cabins out there, the GardenStyle Amboise Corner Log Cabin is high on style as well as quality. 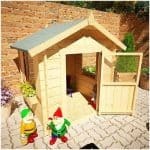 This works very well as a corner summerhouse and it is going to be a great place for you to relax and enjoy a few glasses of wine after a hard day’s work. Enjoy a little get together with the friends and family or even as some kind of epic game room. There is just so much you can do with this and as it looks so gorgeous it is going to be the major highlight of any garden it is installed in. This is one very well made structure. It is made with high quality pine logs that are a very impressive 28 mm thick that make the whole structure just incredibly robust. 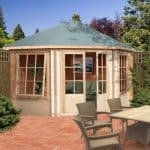 The conical style roof is made with high quality felt and solid sheet boarding. That same kind of boarding is used for the floor and underneath that are floor joists which have been pressure treated to ensure that no matter what kind of wild party you have going on or even what kind of heavy furniture you decide to place inside will not affect the floor at all. 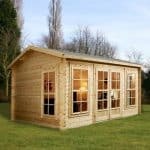 Ideal for those of you who want a fantastic looking corner summerhouse or log cabin, the GardenStyle Amboise Corner Log Cabin is a very stylish log cabin that really does capture your attention the first time you see it. The interesting shape is one of the things that catches your eye, but we feel that the fact they have used top of the line pine wood for the structure is a huge reason why this is so captivating. This is a very good size as it is 9 feet 9 inches in both its width and depth. So this actually offers a very decent amount of space, but not at the expense of taking over the whole garden. It has an enormous amount of headroom with the lowest point being well over 6 feet high and the middle of the log cabin standing at an incredible 9 feet! The roof is just flat out awesome, well actually flat is not really the right term to use as this is a conical style roof. The roof is made with some nice and thick solid sheet boarding. This is actually very strong wood so we have no concerns about it at all. Covering the solid sheet boarding is some smart looking roofing felt. The design of the roof is never going to allow rain to sit on the top as it is so steep which is something we like to see. 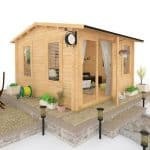 The GardenStyle Amboise Corner Log Cabin is clearly one great looking corner summer house. Very interestingly they have gone for these interlocking logs. Now you can see right away that these look amazing. But they are also very strong as they are 28 mm thick so if you were to give the wall a tap with your hand, you would feel right away how solid these walls are. We are very impressed with the walls in both their design and in how strong they are. Due to the pine logs that have been used to make the walls, there is not a need for a big and bulky frame that eats into your space. So while there is not a frame that holds this all together like you would find in a shed or even a more traditional summerhouse. Do not worry as these pine logs are so robust. With how good looking the walls, the roof and in general just the whole summerhouse is. It is very easy to overlook the floor. Now the floor is made with the same kind of solid sheet boarding that the roof is, but underneath it are pressure treated floor joists that allow the floor to take an incredible amount of weight. The inclusion of these floor joists is something that really impresses us and it is sure to impress you when it can take the weight of your drunken dance moves. 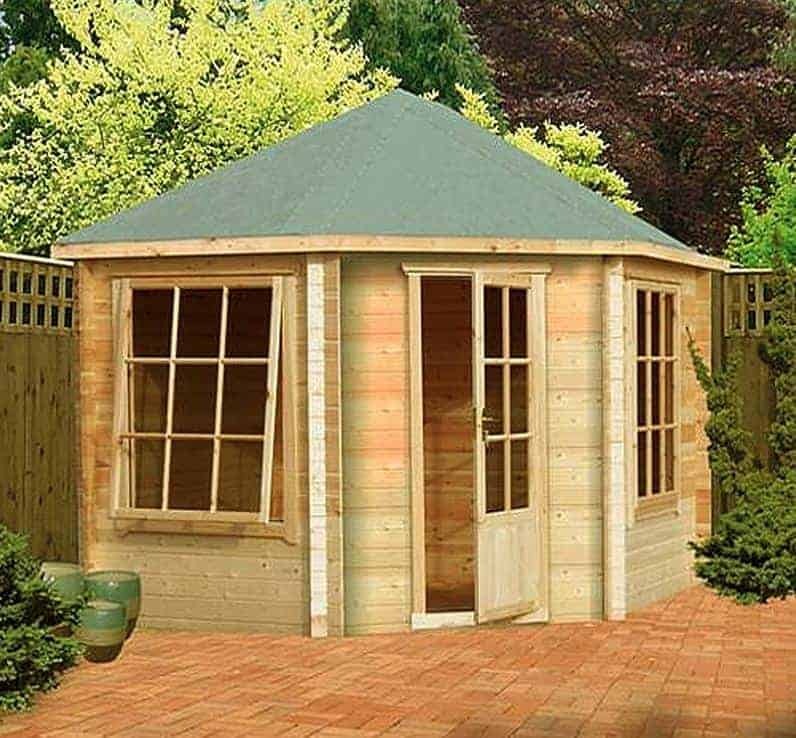 The GardenStyle Amboise Corner Log Cabin will need a good coating of wood treatment once you have installed it and please do not keep putting it off until the next weekend. We have heard horror stories from people who kept putting it off and then out of nowhere rot starts to appear! Keeping this free from rot is your responsibility and it will need a fresh coating once a year to do so. This is a very good corner summerhouse and we are sure that most people will get 20 or so years out of this. But there is only a one year guarantee with this log cabin which is a little bit disappointing. Still though as long as you look after this properly you should not have to make use of the guarantee anyway. The door is very interesting as at first we thought they made a mistake by not having a double door. But the more we looked at it and the more we thought about it, we realised that actually the single door looks great. Right in the front of the log cabin, the door is a good size as it is 5 feet 9 inches high and 2 feet 9 inches wide. The door has a great look to it with some very nice framing and high quality windows that make it look just like a door you would see on an actual house. The door was a feature that the more we looked at it the more we appreciated how smart a design choice it was to use this particular door. As well as the windows on the door there are two large windows on the side. These windows are just incredible. They are not only large they are made with 3 mm thick horticultural glass which is very strong and it also has a high quality look to it. The framing is very well made and they even have draft seals so it will be cosy in the winter. The windows can actually be opened so if the weather is good then you can crank those windows open and let in some fresh air. The door on the GardenStyle Amboise Corner Log Cabin has a lock on it so your more expensive items like a stereo or a TV will be safe in here. The windows also can very securely be closed so there is no way in for any potential thieves out there. So in all we are very impressed with the level of security that this corner summer house offers. We have seen quite a few summerhouses and log cabins and this one is not offering as much security as some of the other ones we have seen. Those huge windows and windows on the door do make this quite an open structure, but that is nothing a set of blinds or curtains cannot fix. If you want to give the log cabin a bit of extra personality then be sure to have a think about using a coloured wood treatment. There are a staggering amount of different coloured wood treatments out there so no matter what your style is there is sure to be a wood treatment that is just perfect for you. 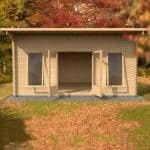 Now there are a couple of extras available for the GardenStyle Amboise Corner Log Cabin, but they do not actually give you any prices. They mention that you can upgrade to a slate roof which we are sure looks amazing. They also have an installation service as well that might be worth asking about if DIY is not your thing. While these are two totally reasonable extras to offer people, we find it off they do not have a price listed for either. We were very impressed with this log cabin and feel that they really did a great job. There really is not anything major at all were we would say that they could have done this better. Structurally this is going to give you many years of service, but in order to keep it free from rot then you will have to make sure you treat the wood on a regular basis. A fresh coating once a year is all it takes to keep those lovely log panels looking great. This is a very good size. It will give you a lot of space to play with, but it is not going to be a log cabin that only really large gardens to install. You are going to be very impressed with the amount of room that this gives you. With some crafty planning on your part, you can fit a whole load of items in here. You are going to need another person to help you install this, but it is not going to take a whole weekend. You are looking at around 6-8 hours and it is not over the top hard so there should be no tantrums thrown when piece A does not slot into piece B like the instructions say so. We know this is far from being a cheap log cabin, but you are getting a lot of value for your money here. If looked after just right, you are going to get 20 or more years out of this. 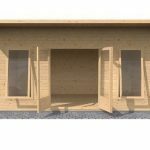 Final Thoughts: The GardenStyle Amboise Corner Log Cabin is a very impressive structure. No matter if you refer to it as a corner log cabin or a corner summerhouse, you are going to have a great time with this. It offers you just the ideal amount of space to use. Because of the way this looks you are going to really love showing this off to your friends and family. This is something that is not cheap, but if you are willing to save up a little longer or just go all out and treat yourself, we are certain that you are going to be very happy with your purchase.